Danny has a new site for his solo music. 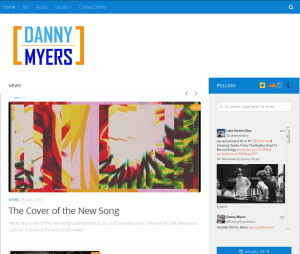 Follow him at DannyMyersMusic.com, Instagram or on Twitter. This was written by Dan Myers. Posted on Tuesday, January 27, 2015, at 2:25 pm. Filed under News. Tagged danny myers, danny myers music, dannymyersmusic.com, news, website. Bookmark the permalink. Follow comments here with the RSS feed. Post a comment or leave a trackback.